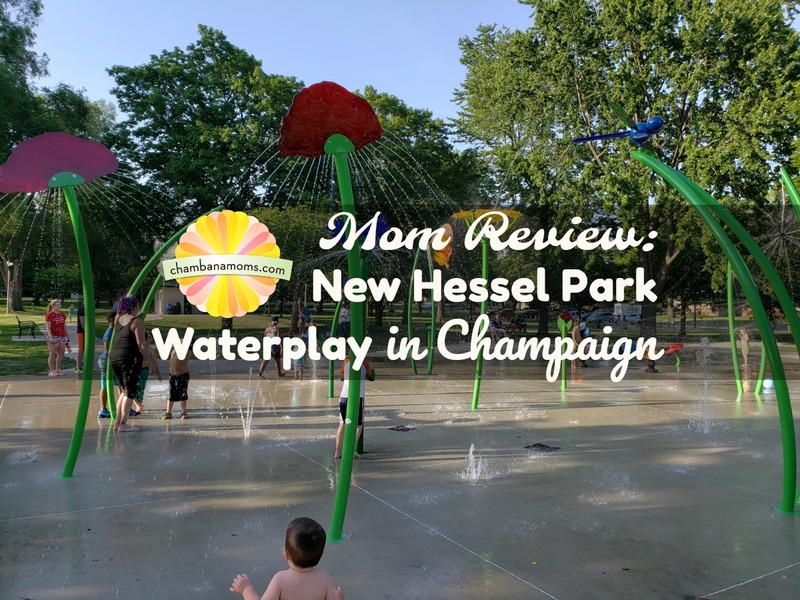 I grew up a block away from Hessel Park in Champaign. It always feels like coming home. Like visiting my own childhood. Although, as a child, I could only wish for the kid oasis it has become. It looks much different than it did three decades ago. The playground at 1401 Grandview Dr. is new and bright because of the recent update. Even more exciting, however, is the warm weather respite—the new Hessel Park Waterplay. The water attraction also makes the park part even more appealing as soaking wet kids rush down the slides even faster. We have all been watching for months as soon as protective fencing went up. Excitement mounted as the ground was broken by machinery, and the signs previewed what’s to come. Promises kept. The Champaign Park District (CPD) once again delivered, and they delivered just in time for a brutally hot summer. 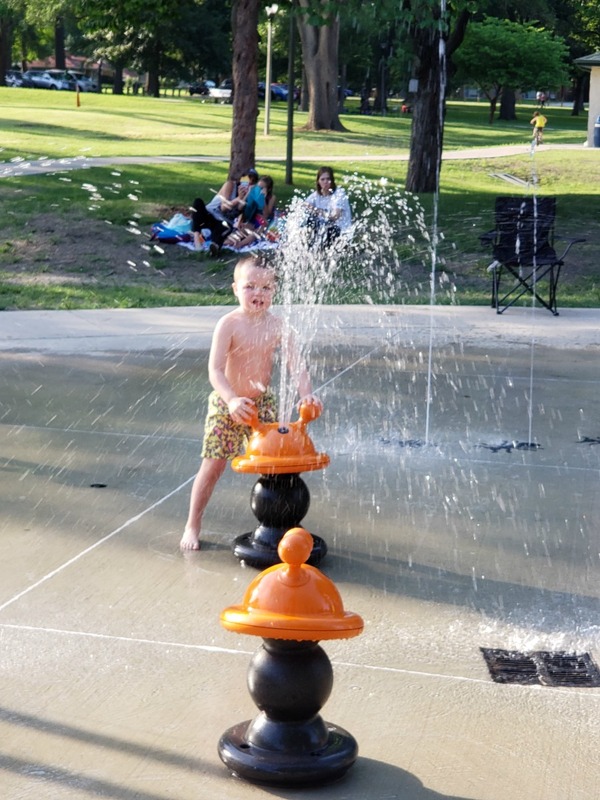 The splash pad holds the same hours—11 a.m. to 7 p.m., all week long, from Memorial Day to Labor Day. I noticed it was a little muddy after a day of rain. However, it wasn’t even close to the puddles of stagnant water that formed around the previous pad. If it’s raining or pouring, they are still running. Unlike pools, they don’t close at a hint of thunder. You play at your own discretion. However, the rules state that the use of the splash pad is prohibited when thunder is heard/lighting is seen. This includes a 30-minute period after the lightning/thunder is detected. Parents (16 or older) must supervise their kids, one adult per three children. No drinking splash pad water! Gross! No street shoes. Only bare feet or swim shoes are allowed. No baby strollers or carriers, bicycles, skates or scooters are allowed near the play features. OK, I saw this rule broken. A lot of kids had little bikes/trikes on the pad. No soap shampoos, conditioners, lotions or body washes are allowed near the play features. Only clean swim apparel may be worn at the splash pad. Kids who aren’t toilet trained must wear tight plastic pants over a swim diaper. No one was doing this. The new splash pad has an overall theme of bugs/critters. Flowers, snakes, butterflies and cute insects spout water. There’s even a spider spinning a water web! The entire splash pad is run by a computer that makes the activators “live” during open hours. When the button is within the open window, the splash pad features go through a timed spray routine. When the spray routine finishes, the activator needs to be pressed again. Kids of all ages packed the concrete slab. My almost-2-year-old son was more interested in running to the park, and he kept running down the awesome .6 mile walking path. Any established walker should theoretically enjoy the pad. 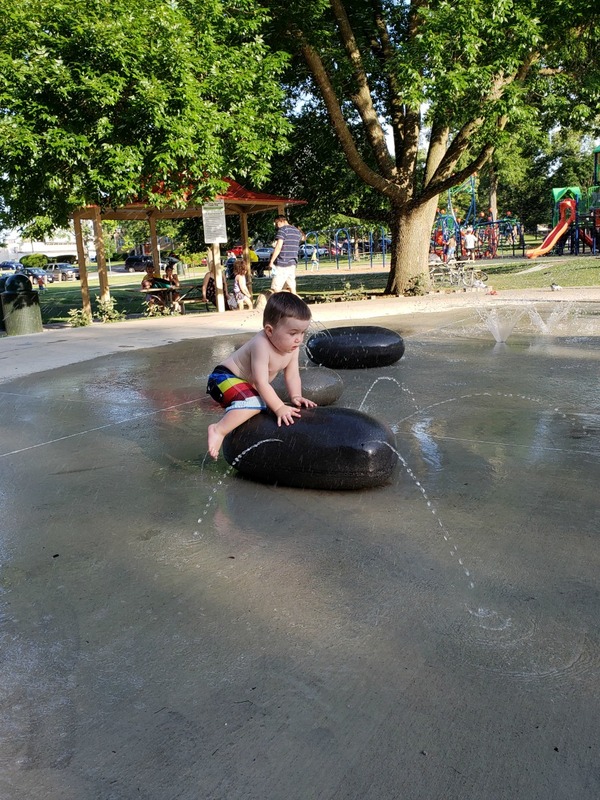 My 5-year-old son loved the splash pad! He liked the shooting features best, of course. He would try to “shoot” other splash padders. There were moveable parts on many of the installations. The most popular feature was the hourglass. It fills up to a certain point with water, and it ideally tips over. Each time I visited, it wasn’t functioning as it should be. Adults or tall kids were jumping to tip the glass over manually. The kids loved getting pummeled with water. 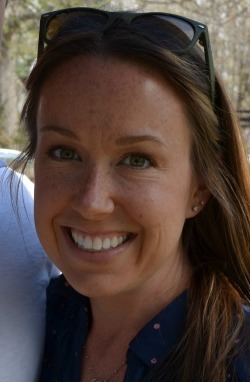 CPD director of marketing and communications, Chelsea Norton, said the buckets at splash pads are notoriously touchy. This is something they are keeping an eye on. It’s perfectly fine, however, to tip it by hand. She wants to remind visitors that the tipping buckets are for water only. Do not put anything else inside the tipping bucket! The Douglass Splash Pad is similar in size and aesthetic to the Hessel version. In fact, the CPD smartly designed the two pads so features were interchangeable! The old pavilion remains. Bring your lunch or a snack to enjoy there. There are also benches for onlookers to watch the fun. If you need to change or potty, there is a bath house super close. The evolution of Hessel Park is officially a wrap! Time to just enjoy.